It’s not often that Rory McIlroy is happy to shoot a four over par 75 but such is the degree of difficulty presented by the US Open that the 21 year old Holywood star trooped back to his hotel room overlooking the first tee with hope in his heart. 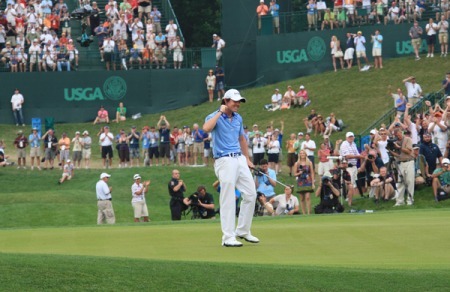 It’s not that McIlroy played well in just the fifth round of his US Open career. But he was pleased that he didn’t let a bad run get him down and throw away his hopes of finishing high up the field or even challenging for the title with another of his Sunday charges. Starting on the 10th, McIlroy parred his first four holes alongside eight time major winner Tom Watson and the 18 year old Japanese teenager Ryo Ishikawa, who shot a fine 70. Then Pebble Beach - a dangerous animal when it’s set up for a major - jumped up and bit him. Having described the 14th as the most difficult par five he’d ever seen, McIlroy missed the green to the left and ran down a steep slope, under the bough of a tree. Watson had finished in exactly the same spot but had the experience to bump his recovery into the slope and limit the damage to a bogey. The veteran would take 35 putts in a seven over 78 but McIlroy’s problem was not his flat stick but his commitment. Similar to any other dangerous animal, a gesture of fear is interpreted as a weakness and the results are never good. McIlroy suddenly became defensive in his iron play and failed to commit to shot at the 16th and 17th, shoving them right. He bogeyed both and dropped another shot at the short, par-four third before steading the ship with maturity. A birdie at the par-five sixth limited the damage to 75 blows and McIlroy knows he is not out of the title race just yet. “I’m not disappointed,” he said. “I played poorly for a stretch by not committing to those shots and the round could have gotten away from me. Graeme McDowell has a lot more experience than McIlroy at this level. But after leading the Irish quintet with a level par 71, the Ulsterman admitted that it was tough to be patient. McIlroy learned a valuable major lesson on Thursday at Pebble Beach. It’s that total commitment and endless patience are the only virtues worth having in a US Open test. Knowing McIlroy, he won’t make the same mistake twice. Rory McIlroy lived up to his billing as a major champion in waiting when he climbed to within striking distance of a top 10 finish on his US Open debut. The syrupy swinging Ulsterman moved swiftly up the final round leaderboard with two birdies in his first 10 holes before play was suspended until 9am on Monday at Bethpage Black. Bethpage at dusk - the 4thAs leader Ricky Barnes bogeyed the first to fall back into a share of the lead with Lucas Glover on 7-under par and then hooked his tee shot into deep jungle territory at the second before play was called for the day, McIlroy headed home nine shots off the pace on 2-over. That was just two shots outside the top 10 and enough to give the Holywood starlet a tasty target to shoot for when he resumes on the second tee with a birdseye view of the leaders ahead of him in the fairway. Rory McIlroy knows he can win a big one some day after clinching his first top 10 in a major on his US Open debut at Bethpage Black. In only his second major start as a professional, the 20-year old Holywood hotshot fired a 2-under par 68 in the weather-delayed final round to finish in a six way tie for 10th with the likes of Sergio Garcia and Mike Weir on 2-over par. It's only a matter for time before Rory McIlroy wins a major“It’s been a great tournament and a great experience for my first US Open and I would love to come back and win it one day,” said McIlroy, whose 68 was only bettered by Ian Poulter’s three under 67 in the final round. “It’s been a long week but I feel like I have done very well. I have made a great start to my Majors career – 20th in the Masters and now a top 10 here. It’s been a good start. Rory McIlroy has no intention of playing defensively this weekend. Credit: www.golfffile.ieNo mercy. That was the stark message from Rory McIlroy to the rest of the field after his smashed multiple records en route to a second round 66 and a sensational, six-shot lead over YE Yang at the halfway stage of the US Open. The Holywood star, 22, played even better than Tiger Woods in his pomp as he became the first player ever to reach 13 under par in America’s national Open. Now he plans to push on and smash the field into submission with a weekend McAttack. And not even a double bogey six at the last that ended an incredible 35-hole bogey free run could sway his focus as he topped the leaderboard on 11 under par to set a new 36-hole low of 131.